I find myself today in a living room apartment on the campus of the University of Science and Technology in Nanjing, China. It belongs to a retired professor of mechanics at the university who is the father of Li Hongxuan’s husband, Tang Yufeng. We have finished a breakfast of egg and rice dumplings and some different varieties of fried dough. Their thirteen year old daughter nicknamed DouDou is entertaining us with her schemes for me to do her geometry homework, while we await the noon time sirens on this special day of December 13. This date is kept in memory for the Nanjing Massacre. Americans may know little about this for it occurred during the Sino-Japanese war, when Japan attacked China, occupying Shanghai and then occupying the then capital Nanjing. The battle for Nanjing lasted about 3 months and about 300,000 Chinese died, where about half died after the conquest in acts of atrocity that are too horrible to report here. Eight years later after the Japanese were finally defeated, many involved soldiers were executed for the atrocities by an international war tribunal. I know about this because Yufeng brought me to the Nanjing Massacre memorial museum a few days before. It is a modern recently built museum that is really sobering to visit. The only place like it is the Holocaust museum is Washington D.C. The museum goes to great lengths to verify that such a massacre occurred for it seems it was doubted by the world because the Japanese had a great propaganda campaign that they were actually helping the Chinese. The epilogue written on the hall wall exit says it best “……to remember the acts of the past will help us build a better future”. When you leave the hall and building there is a large statue of a women releasing a bird from her hand and at the bottom in large letters is “Peace”. Out in front of the entrance to the museum there is a large modern all black statue of a distraught women with one arm covering her forehead and the other arm dangling holding a small limp child, the statue is called “Ruined families”. We must say that living with a Chinese family for over a week is something special. There are not too many big difference between us, but a host of small differences. Outside the gated university campus there are more cars than I would have thought and they are all only a couple years old. Absent are SUV’s, and in their place are numerous bicycles that are way outnumbered by the cars and most are electric and the bicycles are outnumbered by electric motor scooters. It is a real challenge to cross the main streets until one learns the method by watching, it is different than in NYC streets. Any quick movement in the street is dangerous for it is a slow motion weaving of cars, buses, bicycles and pedestrians, only for the experienced, where you find yourself standing in the street with vehicles traveling around you while you move slowly and the flow of the traffic adjusts to you. There are new pedestrian road underpasses built in the busiest sections that are real handy. There is new construction everywhere. Nanjing is in progress of building a subway system. Yufeng tells me when it is finished the total trackage will be 300 km. Beijing’s subway was build first, for the Olympics and it is grand and only cost 0.30 US$ to ride everywhere. All major cities are in some phase of building a subway to be completed in the next couple years. Yufeng is one the friendliest people one could meet. On our walking sight seeing tours with his family, he would constantly stop and ask people on the street how to get to certain sights, I mean a lot. When stopped at sidewalk crossings he would talk to everyone next to him, when in a taxi he would for the whole ride be in a discussion with the driver. He was in the street once hailing a taxi when a car stopped for the red light and its window was down and he started chatting with the passenger until the light turned green. He always has a smile on his face and is eager to help us with anything he may think we need. He is one of a kind. When we arrived he did not know any English. Then one day his English picked up immensely. He had discovered and studied translate.google.com overnight and he could then converse with us better. He and I had more detailed conversations using this tool and we learned a lot about each others lives. There are 3 classes in China and Yufeng is in the middle. The wealthy are growing fast and the poorest is the biggest. Elections are held but only one person runs and Yufengs says he never knows anything about the person because he does not campaign. He pays taxes, contributes to a pension fund, buys everything with cash(a car and 2 apartments), takes naps at work, has 130 hours of rest days from work counting Saturday and Sundays, works 42 hour week, rides 2 hours on a company bus to work and works as a QC tester for a large Petrochemical company. A total solar eclipse is occurring in China in January and he is planning a rest day to visit the area of China where it will be total. One of their apartments they rent out and is going to be their new home because it is larger, but they are waiting for the subway to finish before they move in. They switched apartments with Yufeng’s parents to accommodate our stay. One of the biggest differences in our two lives is with the use of heat. As I mentioned in a previous blog that the new Beijing rail station was not heated, so are many buildings not heated everywhere. In their apartment bedrooms there are wall heaters high up on the walls. The kitchen, dining, and living room are not heated. We all change into a thick soft comfortable over coat and pants and slippers to keep warm. It is customary to take off your shoes up entering the home and put on the warm slippers. Yufeng does not like the garments so he wears his winter coat. It seemed strange to us at first to sit around the dining room table and see your breath and hold a cup of warm water in your hands, but we found this is common in China. The food in China is varied and plentiful. I wish I knew the names of it all. We went to what I would call a real good restaurant by American standards one night and we had 7 different plates of meats and vegetables in the middle of the table for 5 people. It cost $18. Yufeng, Ann and myself stopped for a late dinner once in a buffet style restaurant and Yufeng bought a roasted “salt water duck only in Nanjing” he wanted us to try. That is probably the only food I know besides the rice bowls. The food is all delicious that I ate. Unfortunately there was not enough time to try all the different varieties. There must be hundreds of different kinds of dumplings, there are even fast food dumpling restaurants. Ann has stuck to her diet of toast, chips and coke. 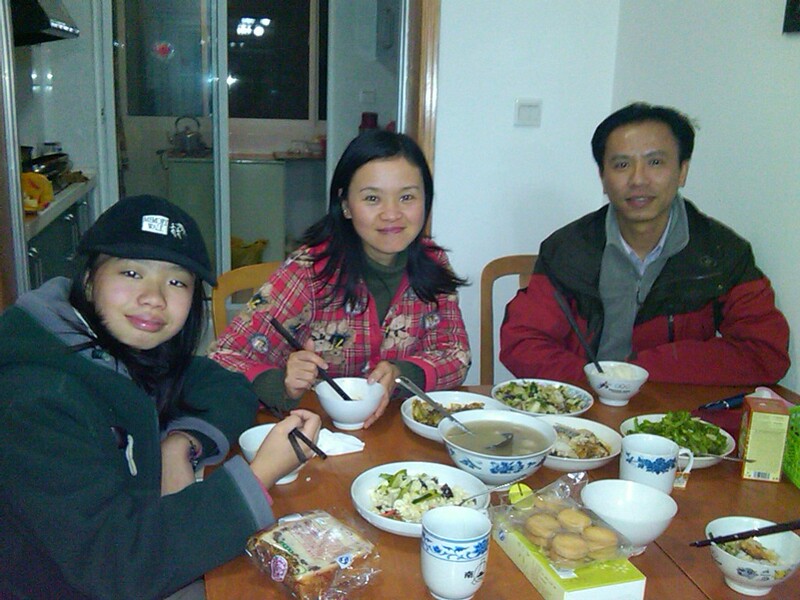 Yufengs wife is a school teacher in the school where their daughter attends. DouDou must be at school at 7:30 and classes are over at 5:30, the same time that Hongxuans workday is over. When Ann went to the school to give a presentation on drug addiction, which none of the kids have any familiarity with, we had to wait for DouDou until 6:00. 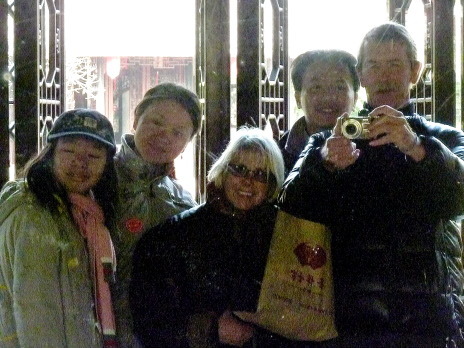 It was great to see Hongxuan and meet her family. She spent a year at Orenda Elementary School and with us five years ago. Nice report. It’s almost like we are experiencing it with you — especially the cold–it has been brutal the last couple of days here, but at least I have heat in my kitchen. Hope you have a nice XMAS and New Year in your new adopted environment. Glad you’ve been able to use it. Even though there aren’t any walls, there is probably a cross street in the middle of every city where the streets run north, south, east, west. (for example, every street east of the I-5 in San Diego is east-something-or-other street, and every street south of University Ave. is south-something-or-other street). Once you find those points on the map, you are in business. I have to tell you that I really look forward to reading your blog. What an incredible trip!! It’s so nice that you take the time to let us know what you’re doing and where you are. As usual, Ann, your Facebook comments are hilarious. Merry Christmas!!! Loved hearing about your visit with HongXuan. I thought it odd that everyone had coats and hats on while eating breakfast. We must be really “soft” here. People all over the world are more or less the same. Sorry Hongxuan, with so my pictures I could not remember if it was morning or evening. Either way ‘Doudou’ was cute with the hat, and Ann noticed it was the Memory Walk hat. The weather in Clifton Park at the moment is brutal compared to Nanjing, Shanghai, Hong Kong and even Beijing. There are some Palm trees in Hong Kong and it’s in the 60’s today. I spotted a couple palm trees in Nanjing and Shanghai. It does not snow much in these cities. I think the climate may be similiar to the Middle Atlantic States. When i was young, we had nothing but a coal stove to keep warm. (My mum cooked beans on the stove, it smelt so good)We did sports to keep warm. China is still a developing country. A lot of people still suffer from hunger and coldness. I see China developing and developing fast. It is incredible all the construction going on everywhere we where. See my next posts for more on this.